Apple Chief Executive Tim Cook was in Israel on Wednesday, and had a meeting with President Reuven Rivlin, as Apple is prepared to open a new office in the country. There was much speculation for weeks about an impending visit from Cook to Israel, and that was confirmed on Wednesday when the Apple CEO sat down with Israel's president. 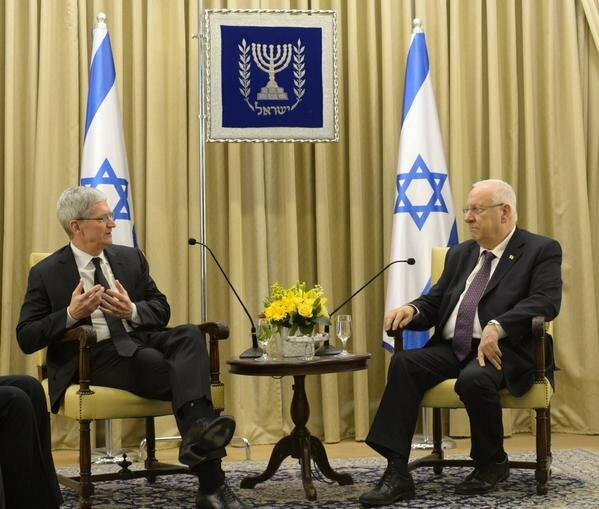 Photos of a discussion between Cook and Rivlin were shared by Inbal Orpaz. Cook's appearance coincides with the opening of a new research and development office in Herzliya Pituach, about 20 minutes north of Tel Aviv. The building will house 800 employees who worked for flash memory maker Anobit and motion sensing company PrimeSense, both of which were acquired by Apple. It's expected that Cook will commemorate the opening of the new offices as part of his visit to the region. The 12,500-square-meter facility will house some 800 workers. Apple has a significant corporate presence in Israel, with additional research and development sites in Ra'anana and Hafia. Cook's stop in Israel comes a day after the Apple CEO was in Germany, where he visited the offices of tabloid publication Bild, and also met with some of his company's retail workers. While in Germany, Cook is alleged to have let slip that the upcoming Apple Watch could have greater water resistance than expected, and may be wearable while in the shower.